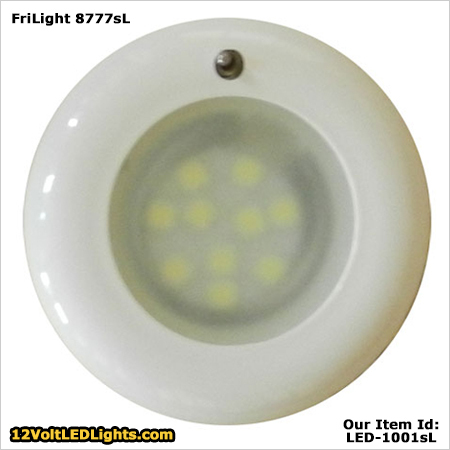 Home > LED Dome Lights with Switch > FriLight 8777 Nova LED Dome Light with Toggle SWITCH, 12 volt/24 Volt(10-30vdc). Recess Mount. Choose soft Warm White 3 Way LED, bright Cool White LED, soft Warm White LED, Red, Blue, or Bi-Color LEDs. 6 bezel choices. Optional Spring Mount Clips. 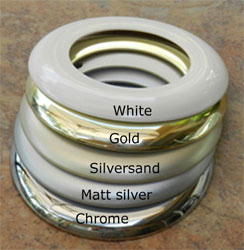 White, Chrome, Gold, Silver Sand, Matt Silver, Beige. *** Choose a 3 Way LED Bulb. Alternate between brightness levels by toggling power off, then back on. With a wall mount switch you can control an entire bank of lights with the 3-way bulbs operating in unison. I was really pleased to find this LED version of the halogen FriLight fixtures I have all over my 2005 Dufour. The installation was as simple as cutting the existing wires and crimping the new fixture to those wires. Mounting holes lined up exactly and the old trim ring can be used on the new fixture. These are the brightest warm white LEDs I've found and current drops from 1A for the halogen to 0.1A for the LED. 3 Way Bulb is so cool! The 3 way bulb option is so cool and so easy to dim the lights with. Way less costly than a separate dimmer.